How quickly will these devices permeate our schools as barriers to adoption fall? The other night in a meeting at my son's high school, a science teacher held up an iPad and exclaimed, “this is what they should be using instead of this“, holding a text book in the other hand. The next day it hit me, as if I'd known it along and had just failed to grasp it – it's only a matter of time before computer “tablet” devices displace text books and note-taking devices in our schools. It's hard to imagine a scenario in which this would not eventually be the case. Of course, some of us may remember the first coming of the tablet, which fizzled. There was some excitement over their potential in the earlier 2000's that didn't really pan out. But as the decade drew to a close, Apple's iPad raised the tablet game to a whole new level. 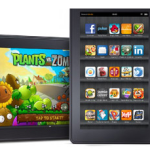 This year, following close on Apple's heels, a lot of other players are going to try to get their new or updated tablet devices in on the game. Education technology blogs and forums have no shortage of stories about the iPad and e-readers being adopted in schools, and ways to use them in the classroom. There are even websites named with specific tablet device market leaders in mind (just check out ipadeducators.ning.com, www.ipadinschools.com, or www.edukindle.com). iPads set to replace school textbooks in Georgia state? Even with the growing acceptance of the iPad and other tablet devices in education and business, they still have a long way to go before they achieve mainstream adoption. What do you think stands in the way of this in the educational environment? What are the biggest barriers – money, standards, awareness? How about the main factors in favor of their adoption? And just what might you want from a tablet device as an instructor? (Click here to comment. Thanks!). 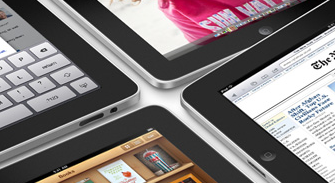 What's Next for the Tablet Niche in Education (Since the iPad Made it Matter)? The biggest problem I see with iPads is while the text is in digital format, it is still not accessible to a text reader. Although the new app from Read & Write Gold looks promising, I think that publishers in general and eReaders more specifically need to consider how many people rely on text-to-speech, and if you’re making it digital go that extra little bit and make it accessible as well! I don’t think cost will be a factor for long. I was just in a cvs and saw a knock off Ipad for $99.00. The technology will eventually be cheaper than the cost of producing a text book and they will be able to update them instead of printing new editions. This will also solve the problem of our children reading outdated text books. I’m sure Apple would rather be at the fore front of an educational movement and sell boatloads of Ipads at half the price to school districts then let a knock off company get the business. I think that the one thing that stands in the way is the cost. While, this may not be a factor in higher ed where students can actually save on the costs of books. This presents a problem for Pre-K to 12 where the amount spent on students can vary by district. The poorer school sistricts will be at a disadvanatage especially with the initial implementation. Personally, I believe that if the tablet is consideredin education it can be as an aide in the learning process. Many faculty members will need to come up to speed with how to use the technology so that it won’t be seen as aburden. I teach at a college where we have three tablet PC labs for 2.5 years now. In order to make tablet usage workable for all subject disciplines, the pen (stylus) feature is necessary. The stylus allows students to write math and science formulation the same way they would with pen on paper. These e-notes are saved to a virtual binder, which is accessible 24/7 with an internet connection. We use software that fives us student collaboration, leadership, communication and interaction. My teaching methodology has evolved to give this learner-centered workspace. As we push the limits of current wireless mobile technology, awareness takes the largest effort.